Such an easy recipe and ridiculously good! For those of who haven’t tried blending frozen fruit for ice-cream, this is a must! The mango adds a smooth texture to this. Cut frozen fruit into pieces and blend the three but make sure you don’t add too much coconut cream or milk, or it doesn’t stay stiff enough. Add a few almonds or even some 100% cacao bits too. This makes about 400-420 grams of soft serve. This is 540 calories and serves two nicely – add a dozen almonds and this pops upto 630 calories. Not bad. While this is not low calorie, it isn’t exactly bad either. Needless to say, a dairy ice cream would be a lot worse and certainly do alot less for your body. 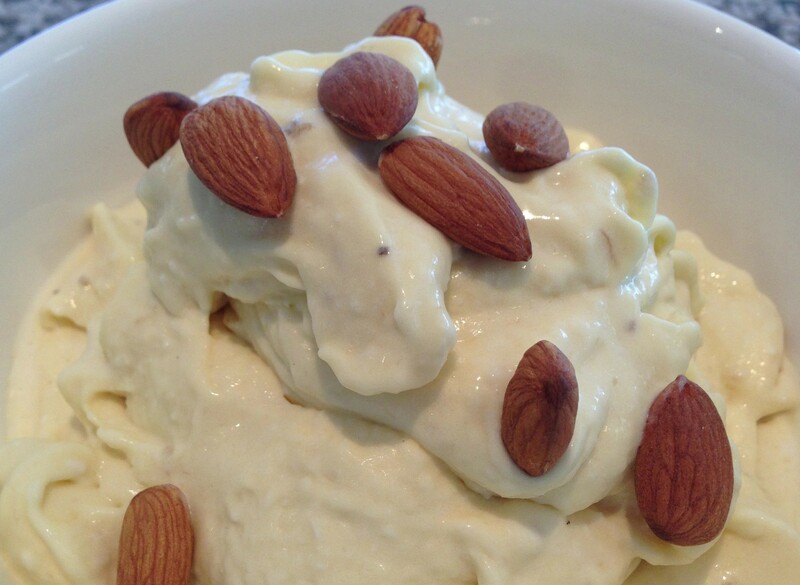 Regular vanilla ice cream of the same quantity and weight would be about 750 calories without any almonds. This entry was posted in Dieting, Food, Health, Lifestyle, Paleo, Primal, weight loss and tagged Coconut, Food, Healthy, Ice Cream, Paleo Diet, Primal Diet, Weight Loss. Bookmark the permalink.